Lina is just like any other fifteen-year-old Lithuanian girl in 1941. She paints, she draws, she gets crushes on boys. Until one night when Soviet officers barge into her home, tearing her family from the comfortable life they’ve known. 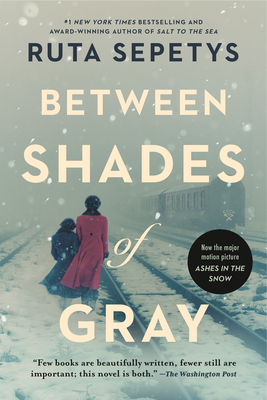 Separated from her father, forced onto a crowded and dirty train car, Lina, her mother, and her young brother slowly make their way north, crossing the Arctic Circle, to a work camp in the coldest reaches of Siberia. Here they are forced, under Stalin’s orders, to dig for beets and fight for their lives under the cruelest of conditions. Lina finds solace in her art, meticulously–and at great risk–documenting events by drawing, hoping these messages will make their way to her father’s prison camp to let him know they are still alive. It is a long and harrowing journey, spanning years and covering 6,500 miles, but it is through incredible strength, love, and hope that Lina ultimately survives. Between Shades of Gray is a novel that will steal your breath and capture your heart. 1 – What did you learn about survival and hope after reading this book? Were your surprised at what the characters had to endure? Would you have hope? 2 – Do you have something or someone you can turn to when things are tough? 3 – Could you relate to Lina? In what way? Lina used art – what would you use to give yourself hope?